Vintage Blast™ has a unique two-stage formula that helps fight dependency and delivers steady energy and hydration during your entire workout. Vintage Blast™ helps you power through rigorous workouts and competitive events, regardless of their duration. 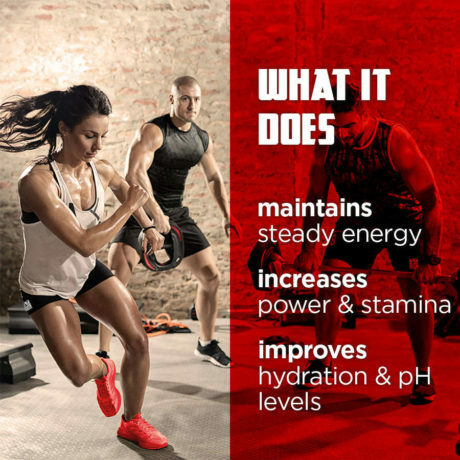 Its unique two-stage formula allows you to start strong and finish strong, so that you can maximize every minute of every activity. By delivering a steady flow of ingredients and nutrients, Vintage Blast™ increases your overall work capacity and pumps, improves mental focus and drive, and reduces soreness and lactic acid buildup — without creating dependency. Unlike regular pre-workouts, Vintage Blast™ also delivers nine key electrolytes and micronutrients that help with hydration, pH levels, and decreasing oxidation to enable peak performance and prepare for the recovery that follows. 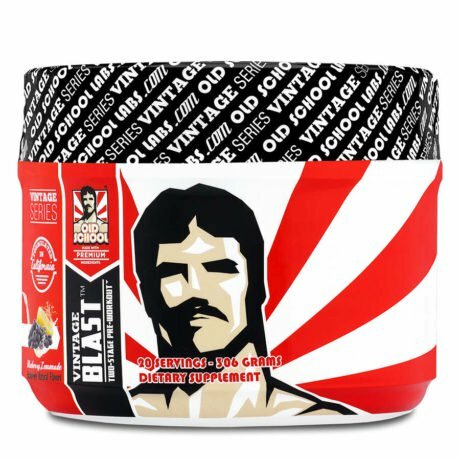 Vintage Blast is part of our Energy & Recovery supplements range. We created it because achieving a balanced, head-turning musculature should never come at the expense of your health. Pre-workout supplements increase your strength and endurance, which in turn, help you work out harder and for longer. 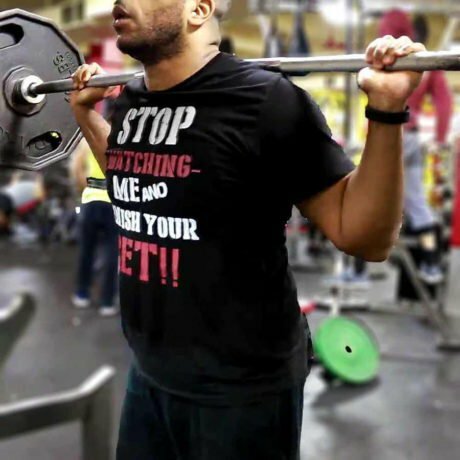 This means you can lift more weights and maintain your exercise intensity without getting tired as quickly. However, that rush that you get from pre-workouts doesn’t feel the same after a while. Why? Your body adapts and you soon stop feeling their effects. As a result, you find yourself upping the dose – at the expense of your health – or switching to another product. 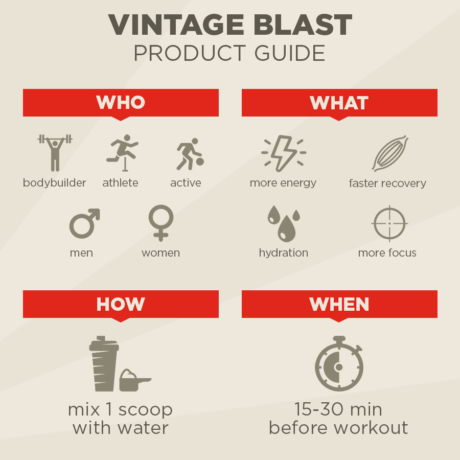 Unlike other pre-workouts, Vintage Blast doesn’t deliver all its ingredients at once. The two-stage formula ensures a steadier delivery rate, which works against dependency, and helps you power through your workouts and competitive events — from start to finish. So stop wasting time and money on one-shot, short-lived solutions — and get the sustained results that only Vintage Blast provides. At Old School Labs™, we set out from the start to be a premium and uncompromising brand, delivering exclusively premium products. We sell our products directly to you and are therefore able to afford including only the best quality ingredients in all our products. 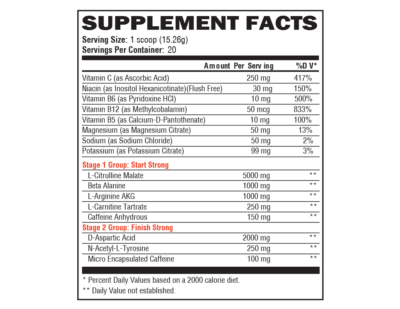 Press More to read about the ingredients you will find in Vintage Blast™ in descending order of weight. 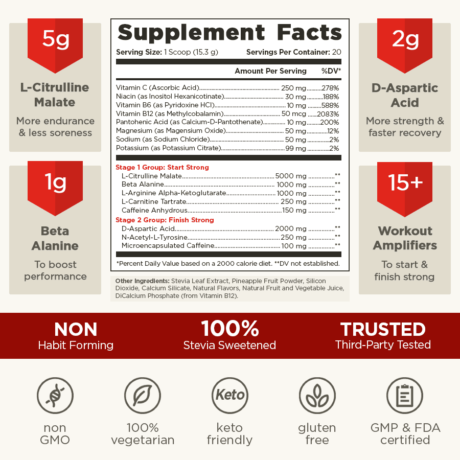 A naturally occurring amino acid that improves endurance, relieves soreness and improves aerobic endurance. An amino acid that boosts athletic performance and exercise capacity, and helps improve physical functioning. Made from the amino acid arginine and alpha-ketoglutaric acid, a naturally occurring chemical. In the body, L-arginine is converted into nitric oxide, which dilates blood vessels for improved blood flow. An amino acid that is important for heart and brain function, muscle movement, and many other athletic processes. A known catalyst of metabolism and thermogenesis, caffeine boosts your metabolic rate and energy expenditure, and increases alertness and focus. Helps enhance endurance and muscular development, and speed the recovery process. An amino acid used by the body and brain to support peak performance by helping alertness, alleviating stress, and improving neural communication. A vitamin that reduces oxidative stress and helps protect proteins from oxidative damage that commonly occurs during training. A form of Vitamin B3 found in many foods and required for the proper metabolizing of fats and sugars. A micronutrient used to convert protein and carbohydrates into energy and essential for getting oxygen to tissues in order to help peak performance. Typically found in avocadoes and high-quality legumes, this water-soluble vitamin plays important roles in energy metabolism and biosynthesis of essential compounds in the body. A mineral involved in multiple biochemical reactions of metabolic function, including energy production, cardiovascular regulation and exercise performance. A macromineral that plays a key role in normal nerve and muscle function, as well as keeping body fluids in normal balance. An electrolyte and mineral that plays an important role in proper neuron function. The “other ingredients” section on supplement labels has unfortunately become a convenient place for some companies to hide their subpar ingredients, fillers and additives in plain sight. This is where you will commonly find the usual cost-cutting and unnatural ingredients that do nothing to help your health—ingredients such as sucralose, aspartame, gelatin, artificial flavors and colors, and a plethora of cryptic chemical substances that really don’t have a place in your body if you want what is best for it. Stevia leaf extract is a natural sweetener that contains no calories. A minimal amount of high-quality stevia is used to remove the bitterness and acidity naturally occurring in the ingredients of Vintage Blast™. Adds a refreshing kick to the signature blueberry lemonade taste of Vintage Blast™. This vegetarian-friendly compound, naturally found in many foods, is used in combination with calcium silicate as a flow agent to aid the manufacturing process and ensure that each bottle of Vintage Blast™ is made to the most exacting specifications. This vegetarian-friendly compound, naturally found in many foods, is used in combination with silicon dioxide as a flow agent to aid the manufacturing process and ensure that each bottle of Vintage Blast™ is made to the most exacting specifications. Only natural flavors go into our refreshing blueberry lemonade taste. Countless iterations of taste-testing allowed us to arrive at a flavor that is not only natural, but tastes great and mixes easily. This natural colorant is free of chemical solvents and GMO ingredients, and is made from high-quality fruits and vegetables to give Vintage Blast™ its light-cherry color. Resulting from the addition of Vitamin B12, DCP is commonly used as a source of calcium and phosphorous. For use as a dietary supplement. Assess your tolerance with one-half scoop mixed with 14-16 oz. water, 15 to 30 minutes before your workout. Then continue with 1 scoop 15 to 30 minutes before workouts. Accustomed athletes can take up to 2 scoops before competitive events. Due to its potency, do not exceed the recommended dosage and avoid taking before bedtime. Do not consume on non-workout days. Does Vintage Blast™ work equally well for men and women? Yes. Vintage Blast™ will deliver excellent results for men and women wanting a pre-workout supplement to help sustain them through rigorous workouts and competitive events. Vintage Blast™ is specifically designed to deliver its ingredients over an extended period of time, rather than all at once, by harnessing the ingredients’ different digestive and assimilation properties. What is the sugar / carb / calorie content of this product? Vintage Blast™ contains no carbs, no sugars, and no calories. The sweetening in Vintage Blast™ is provided by stevia leaf extract, a natural sweetener with zero calories and zero carbs. Can you use the pre-workout and the fat burner at the same time? Yes. You can stack Vintage Blast™ with Vintage Burn™, and many of our customers do exactly that to enjoy the combined benefits. You can start by taking a half-dose of Vintage Burn™ (1 capsule) with Vintage Blast™ and then move up to the regular dosage. If I take Vintage Blast™ in the evening, can it cause sleep issues? The micro-encapsulated caffeine in Vintage Blast™ is active for up to 3 hours after you consume it. Just as with any caffeine product, take your personal tolerance into account and adjust the consumption time accordingly. Should I take a break after finishing a bottle of Vintage Blast™? 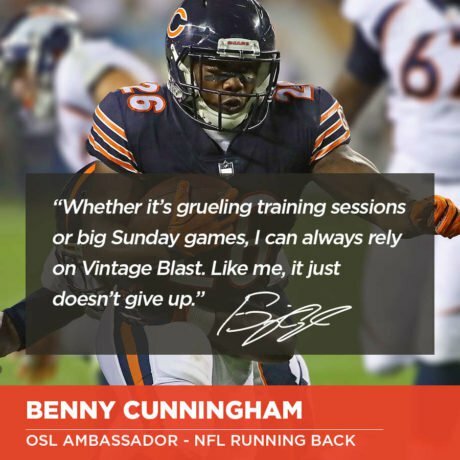 You don’t need to take time off from using Vintage Blast™. You can use it anytime you need it to support your training goals. Does Vintage Blast™ contain any animal-sourced ingredients? Vintage Blast™ is a 100% vegetarian product. There are no animal-sourced ingredients in it. On another note, the facility where it’s manufactured processes milk, egg, soybeans, shellfish, fish, tree nuts, and peanuts – so please take that into account if you have any allergies.